I am ashamed to say that until recently I had no idea what Yellow Dog is and what they do… I thought I was fairly well educated when it comes to dog care but it looks like I missed something. It might be due to the fact that our dogs do not need “special treatment” but still the fact remains the same I missed something important… so I decided to make up for this and share my recent discovery with you… just in case you missed it too or you know someone who can use some help in the dog care department. 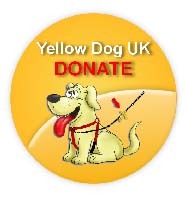 So what is Yellow Dog UK? Yellow dog is an international campaign to create awareness around the world that ‘Some Dogs need Space’. The organiser for the Yellow Dog UK campaign is NarpsUK which is a membership organisation for pet sitters and dog walkers. The CEO of NarpsUK who has nearly 20 years experience in the pet sitting and dog walking industry, she is also a Lantra approved training provider and instructor to teach and educate how to run a pet sitting and dog walking business. The founder says “This is a fantastic campaign and will help and educate dog owners and the public to understand and recognise a dog who ‘needs space”. NarpsUK decided to start the UK campaign because we know how stressful it can be for a Yellow Dog and its owner when a social dog or off lead dog approaches. We believe that by making the Yellow Ribbon an accepted representation throughout the UK that a dog needs space will benefit everyone and make dog walking more enjoyable experience. The yellow ribbon or bandanna can be used for short term periods – i.e. whilst a dog is in training or on heat – or long term – for example if a dog is elderly and does not like young lively dogs around him. We support that it is imperative to socialise dogs for their well being and development but also recognise that there are times and circumstances when a dog needs space and this is a way of letting other dog owners this, we hope that the campaign will encourage dog owners to recall their dogs when they see a dog wearing a yellow ribbon, giving that dog and its owner time to move out of your way and to get him used to people and animals. 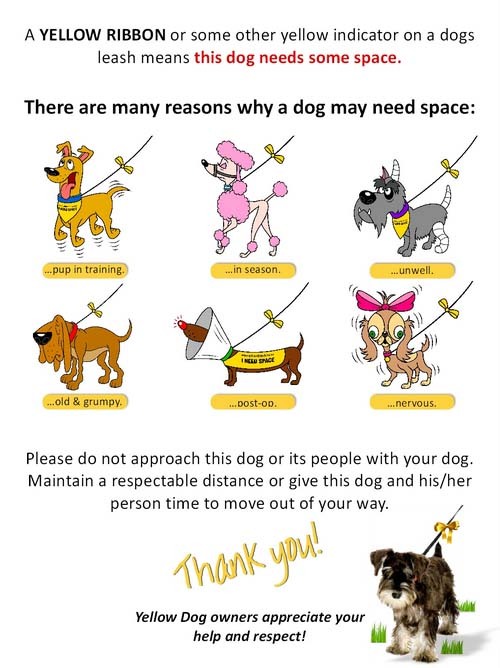 If you’re walking your dog and see a pooch with a yellow ribbon on its lead or yellow bandana around its neck the message is clear – this dog needs some space. I got Stella a yellow ribbon from Crufts last year. She’s always been a sensitive soul but being diagnosed with epilepsy sent her anxiety levels through the roof so we avoid as much excitement and disturbance as possible. I don’t know if it’s been talked about in local schools but since we moved children always ask first if they can fuss her whereas before they’d just bombard her with attention! This is a great idea. Whenever I’m out in public with my dog it amazes me how people just love to come right up to any dog without knowing anything about them. I’ve heard of this before but I’m glad for the reminder! I think that over excitable dogs can wear this too – the ones that get so excited to see you that they jump up and lick everywhere! It’s a great scheme, I had heard of it but it does need more publicity as many haven’t heard of it. Oh no. This doesn’t sound very good. Sending hugs for your Lou-Lou. I’ve never heard of this campaign before but it’s an excellent idea. My dog is a sociable thing but I get quite unnerved when big bouncy dogs come bounding up to us, so a yellow ribbon would be useful for me.